We got this month kicked off with lots of energy at the May Day Strike and Teach-In. Our kiddos had a great time taking the mic and leading our community in the chants they have been perfecting these last few weeks of April. 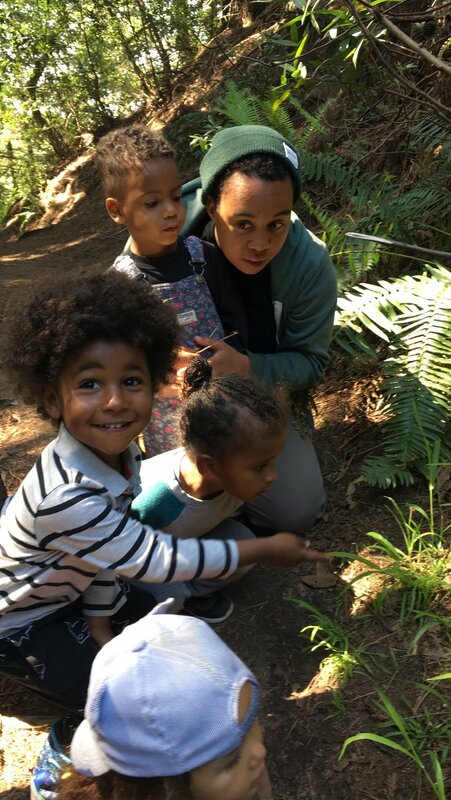 Our teachers are so excited to spend this last beautiful month of our school year exploring new places in the forest and learning about how all the plants and creatures we share the land with in our Earth unit! Everyone has been so excited that the Sour Grass is blooming! Our last unit of the school year is EARTH. We started it off learning about symbiotic relationships between animals, and how animals, plants , and humans are interconnected to make up our ecosystems. We collectively thought through this by connecting our water and earth units and acting out a scenario in which kids became animals in symbiotic relationships with each other (tarantulas and frogs, cleaner shrimp and fish, clownfish and sea anemones), living in a lake ecosystem. When an oil company comes to build a pipeline underneath the lake, we imagined what would happen if the oil spilled, and how the impacts on each species would have ripple effects on the ecosystem. Sequoia class then held a meeting to devise a direct action to block the pipeline. Our hikes through the forest in these past weeks have been interspersed with conversations about indigenous sovereignty and about what it means to live in good relationship to the land we live on and the animals and plants we share it with. Our earth unit also brought on a re-vitalization of our garden plot, and a special visit from the expert gardener Teacher Desi. We weeded, turned the soil, added compost, and planted flower seeds. This month was also an important month to learn about worker’s rights as we geared up for May Day. 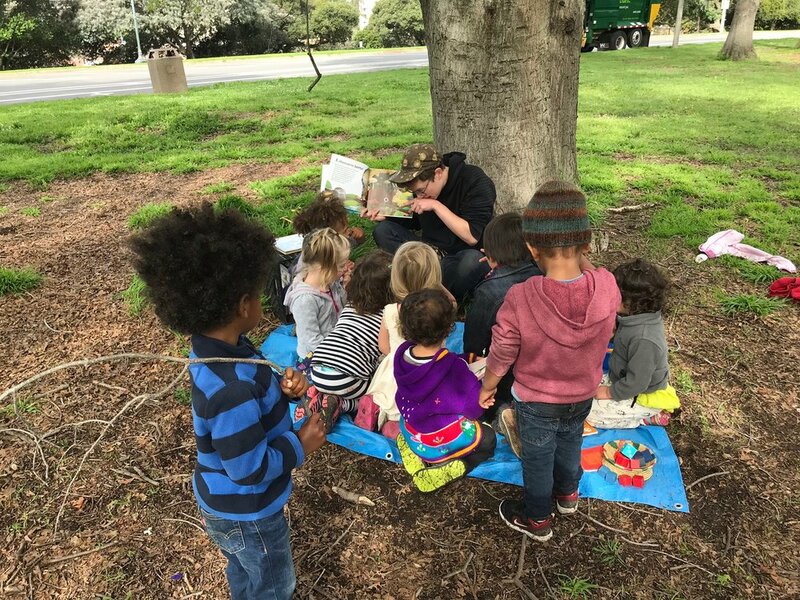 Sequoia class learned about what it means to strike through a dramatic game in which they were space farmworkers earning meager wages collecting space gems (daisies in the field). For every load of daisies they picked, the workers earned 1 dry noodle and the farm boss earned 10. Faced with this injustice, (“Why should the boss get all the money if we are doing all the work?” they asked) the farmworkers held a meeting and learned about the power of a strike, and the need to make a clear and unified demand. 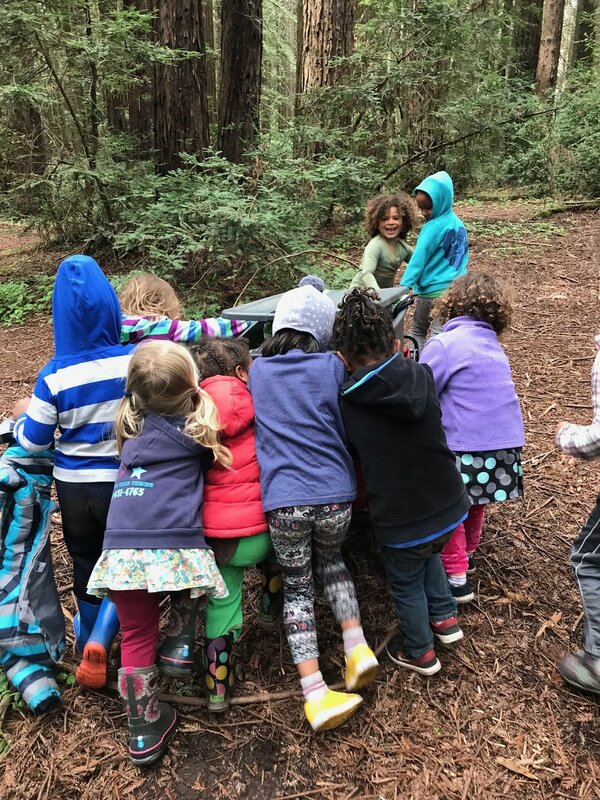 As we move into the final weeks of school in the forest, we will continue to learn about and identify the plants and rocks we encounter there, as well as build our skills as hikers - going for longer hikes, improving our skills of staying together as a group, trail-finding, and leading the group. April was full of chants about workers rights and solidarity! We found answers to questions like, "Who are workers? ", "Are our parents workers? ", "Do all workers deserve to be paid enough money to pay their rent and feed their families?". Everyone agreed that whether someone is a doctor, makes art, picks berries, or takes care of kids they all should be paid enough money to survive and thrive! In our "Strike on Space!" game we learned that workers can use their powerful voices together when a boss isn't paying the workers what they should be paid! This month and last we are also delving into investigations about our Earth! Last month we made connections between indigenous plants and indigenous people (our favorite sour grass is a colonizer! ), and held a mini-protest in solidarity with the indigenous people in North Dakota fighting the Black Snake and demanding that all people recognize the sacredness of their land. This month we will work on identifying some different plants and animals that we share this land with! The sun is out so please remember to put sunscreen on your kiddo in the morning and pack sunscreen in their backpacks! On Monday, May 7th we will be joining the UC workers at their strike on the UCB campus for racial equity for pay and benefits! Abundant Beginnings is starting a Development Committee! The first tasks will be setting up a Scholarship Fund, and creating a five year fundraising plan. If you are interested in joining this group (whether you want to do work for the committee or provide childcare for parents who are on the committee! ), send an email to Maddy! 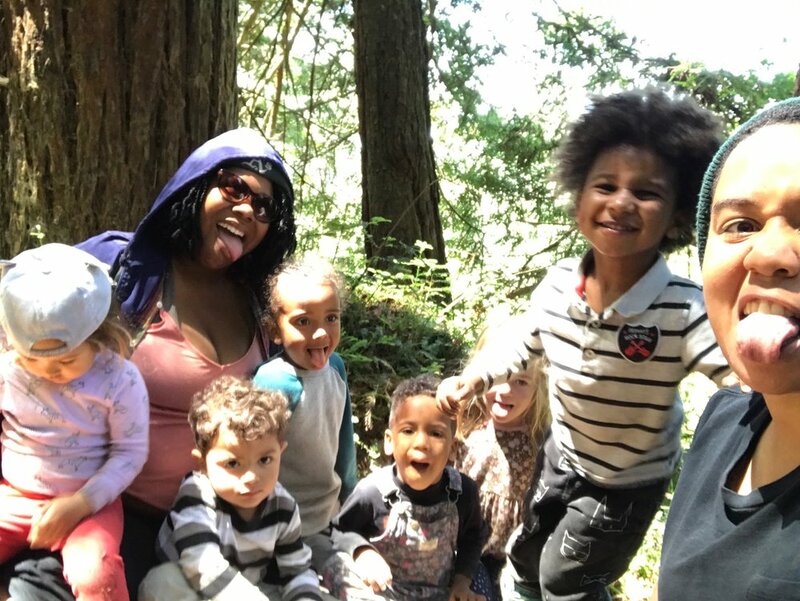 Shayna will be holding a kids activity space at the Malcolm X Jazz Fest on May 19th from 1 - 3pm and she's looking for 4-5 more volunteers to help her! Send an email to maddy@abundantbeginnings.org if you're interested in joining her! We have community passes for the Exploratorium, as well as 10 BART passes to get there on the weekends. The passes allow for 8 people to enter the museum for free. If you're interested in using this pass, send an email to Maddy! We have launched the parent communication app Class Dojo. Many of you have already signed up for it! Be sure to sign up asap to get daily updates on our adventures! This is our last month of school! May 31st will be our final school day together, and we will be having a graduation / community gathering on June 2nd from 11:00 am - 1:00 pm. Location is still TBD, we will send an email about it during the last week of school. Our LOST & FOUND is filling up and we need your help to get missing items back to their owners. We ask that you please label ALL items your child brings to school and check the lost and found each day at pick-up (jackets, hats, stuffed animals, lunch bags, water bottles, extra clothes, etc). 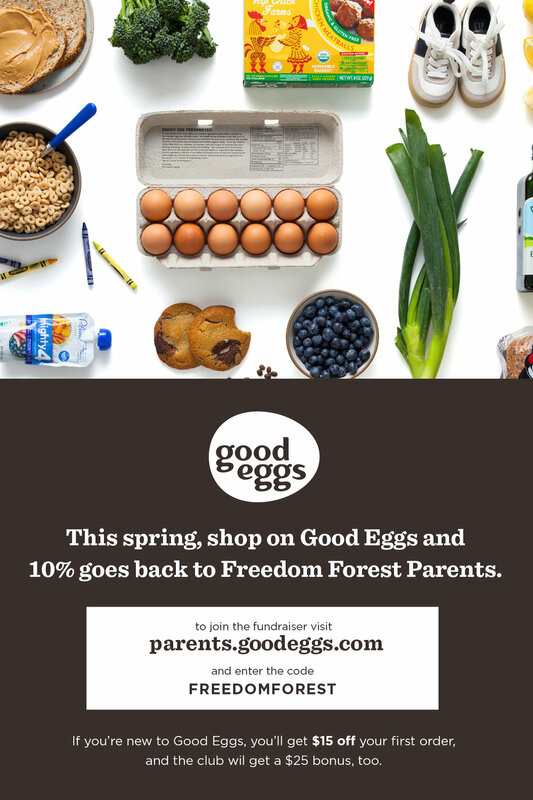 Don't forget to spread the word about the fundraiser for us on Good Eggs! Attached below is the info for how to do it.